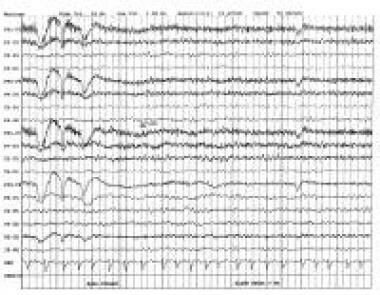 An image depicting temporospatial EEG characteristics can be seen below. Cognitive decline is associated with alterations in the temporospatial EEG characteristics, specifically seen as a decline in resting alpha frequency. However, these findings are non-specific, and medication effects must be ruled out. Certain cognitive screening tests cannot be used with patients who have various handicaps, for example, aphasia or physical limitations in their ability to write. Optimally, cognitive screening tests that are used have sufficiently high sensitivity, specificity, and positive predictive value. False positive results and the attendant emotional distress represent a potential complication. For this reason, young and healthy patients in whom no reason exists to suspect a cognitive disorder should not have a cognitive screen performed. A helpful book for families with a loved one with dementia is The 36-Hour Day: A Family Guide to Caring for Persons with Alzheimer disease, Related Dementing Illnesses, and Memory Loss in Later Life (Nancy L. Mace and Peter V. Rabins). A thorough physical examination, including a neurological examination. Laboratory testing. The American Academy of Neurology recommends screening for B12 deficiency and hypothyroidism in patients diagnosed with dementia. Additionally, clinicians may order laboratory tests to assess complete blood count, electrolytes, glucose, renal and liver function tests, neurosyphilis status, folate, urinalysis, ESR, ANA, CRP, HIV, Lyme, copper, ceruloplasmin, and heavy metal screen. At this time, genetic testing of any sort is not recommended to screen for dementia or for specific causes of it. Other diagnostic tests may be ordered depending on clinical picture: brain MRI, PET, SPECT, lumbar puncture, EEG, and brain biopsy. Cholinesterase inhibitors (tacrine, donepezil, rivastigmine, and galantamine): These medications are approved for use in mild, moderate, or severe Alzheimer disease and are sometimes also used for other types of dementia (for example, vascular dementia or mixed dementias). These medications may produce small, temporary improvements in cognition or functioning or temporarily slow down cognitive decline. Memantine: This medication is an N-methyl-D-aspartate receptor antagonist. It is approved to treat moderate to severe Alzheimer disease. Additionally, memantine together with a cholinesterase inhibitor is a combination sometimes used in moderate to severe Alzheimer disease. The clinical effect of memantine is like that of the cholinesterase inhibitors in that it may result in temporary benefit but does not change the long-term course of the disorder. Other medications that may be used to manage the symptoms of dementia include antidepressants/anxiolytics (eg, fluoxetine, sertraline, paroxetine, citalopram), antipsychotics (eg, haloperidol, risperidone, quetiapine, olanzapine, ziprasidone), and anticonvulsants (eg, valproic acid, carbamazepine, gabapentin, lamotrigine). However, none of these are specifically FDA-approved for use in dementia. Furthermore, atypical antipsychotics have a black box warning stating that their use in elderly patients with dementia-related psychosis is associated with an increased risk of death compared to placebo. Most such deaths appear to be either cardiovascular (eg, heart failure, sudden cardiac death) or infectious (eg, pneumonia) in nature. The decision to use atypical antipsychotics in patients with dementia must involve a careful weighing of potential risks and benefits. Cullen B, O'Neill B, Evans JJ, Coen RF, Lawlor BA. A review of screening tests for cognitive impairment. J Neurol Neurosurg Psychiatry. 2007 Aug. 78(8):790-9. [Medline]. Beeldman E, Raaphorst J, Klein Twennaar M, de Visser M, Schmand BA, de Haan RJ. The cognitive profile of ALS: a systematic review and meta-analysis update. J Neurol Neurosurg Psychiatry. 2015 Aug 17. [Medline]. Hill NL, Mogle JM, Munoz E, Wion R, Colancecco EM. Assessment of subjective cognitive impairment among older adults. J Gerontol Nurs. 2015 Apr. 41 (4):28-35; quiz 36-7. [Medline]. Langa KM, Levine DA. The diagnosis and management of mild cognitive impairment: a clinical review. JAMA. 2014 Dec 17. 312 (23):2551-61. [Medline]. Petersen RC, Stevens JC, Ganguli M, Tangalos EG, Cummings JL, DeKosky ST. Practice parameter: early detection of dementia: mild cognitive impairment (an evidence-based review). Report of the Quality Standards Subcommittee of the American Academy of Neurology. Neurology. 2001 May 8. 56(9):1133-42. [Medline]. Mitchell AJ. A meta-analysis of the accuracy of the mini-mental state examination in the detection of dementia and mild cognitive impairment. J Psychiatr Res. 2009 Jan. 43(4):411-31. [Medline]. Mitchell AJ, Malladi S. Screening and case finding tools for the detection of dementia. Part I: evidence-based meta-analysis of multidomain tests. Am J Geriatr Psychiatry. 2010 Sep. 18(9):759-82. [Medline]. Glasser M. Alzheimer's disease and dementing disorders: practices and experiences of rural physicians. Am J Alzheimer Dis Other Dement. 1993. 23:87-96. Folstein MF, Folstein SE, McHugh PR. "Mini-mental state". A practical method for grading the cognitive state of patients for the clinician. J Psychiatr Res. 1975 Nov. 12(3):189-98. [Medline]. Tangalos EG, Smith GE, Ivnik RJ, Petersen RC, Kokmen E, Kurland LT, et al. The Mini-Mental State Examination in general medical practice: clinical utility and acceptance. Mayo Clin Proc. 1996 Sep. 71(9):829-37. [Medline]. Freidl W, Schmidt R, Stronegger WJ, Irmler A, Reinhart B, Koch M. Mini mental state examination: influence of sociodemographic, environmental and behavioral factors and vascular risk factors. J Clin Epidemiol. 1996 Jan. 49(1):73-8. [Medline]. Borson S, Scanlan J, Brush M, Vitaliano P, Dokmak A. The mini-cog: a cognitive 'vital signs' measure for dementia screening in multi-lingual elderly. Int J Geriatr Psychiatry. 2000 Nov. 15(11):1021-7. [Medline]. Fage BA, Chan CC, Gill SS, Noel-Storr AH, Herrmann N, Smailagic N, et al. Mini-Cog for the diagnosis of Alzheimer's disease dementia and other dementias within a community setting. Cochrane Database Syst Rev. 2015 Feb 3. 2:CD010860. [Medline]. Brooke P, Bullock R. Validation of a 6 item cognitive impairment test with a view to primary care usage. Int J Geriatr Psychiatry. 1999 Nov. 14(11):936-40. [Medline]. Pfeiffer E. A short portable mental status questionnaire for the assessment of organic brain deficit in elderly patients. J Am Geriatr Soc. 1975 Oct. 23(10):433-41. [Medline]. Tariq SH, Tumosa N, Chibnall JT, Perry MH 3rd, Morley JE. Comparison of the Saint Louis University mental status examination and the mini-mental state examination for detecting dementia and mild neurocognitive disorder--a pilot study. Am J Geriatr Psychiatry. 2006 Nov. 14(11):900-10. [Medline]. Holtzer R, Verghese J, Wang C, Hall CB, Lipton RB. Within-person across-neuropsychological test variability and incident dementia. JAMA. 2008 Aug 20. 300(7):823-30. [Medline]. Carrière I, Fourrier-Reglat A, Dartigues JF, Rouaud O, Pasquier F, Ritchie K. Drugs with anticholinergic properties, cognitive decline, and dementia in an elderly general population: the 3-city study. Arch Intern Med. 2009 Jul 27. 169(14):1317-24. [Medline]. Knopman DS, DeKosky ST, Cummings JL, Chui H, Corey-Bloom J, Relkin N. Practice parameter: diagnosis of dementia (an evidence-based review). Report of the Quality Standards Subcommittee of the American Academy of Neurology. Neurology. 2001 May 8. 56(9):1143-53. [Medline]. Qaseem A, Snow V, Cross JT Jr, Forciea MA, Hopkins R Jr, Shekelle P, et al. Current pharmacologic treatment of dementia: a clinical practice guideline from the American College of Physicians and the American Academy of Family Physicians. Ann Intern Med. 2008 Mar 4. 148(5):370-8. [Medline]. Morley JE. Behavioral management in the person with dementia. J Nutr Health Aging. 2013. 17(1):35-8. [Medline]. Stephan BC, Kurth T, Matthews FE, Brayne C, Dufouil C. Dementia risk prediction in the population: are screening models accurate?. Nat Rev Neurol. 2010 Jun. 6(6):318-26. [Medline]. Psychiatry Fast Five Quiz: What Do You Know About Schizophrenia? Psychiatry Fast Five Quiz: How Much Do You Know About Acute Stress Disorder?